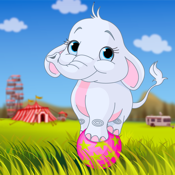 A funny circus -themed puzzle game for children of age between 2 - 7 years. This puzzle-game not only provides entertainment and fun, but also stimulates patience and the ability to focus including cognitive abilities, recognition of shapes as well as eye-hand coordination. Depending on age choosing the proper count of pieces is important so the puzzle is not too hard or not getting boring too fast. For this reason Aaron's puzzles have two difficulty levels. You can switch the motives of the puzzle by tapping on the arrow-buttons. On the info screen of the app there is a message center, where you can provide us with feedback so we can expand and enhance the app.